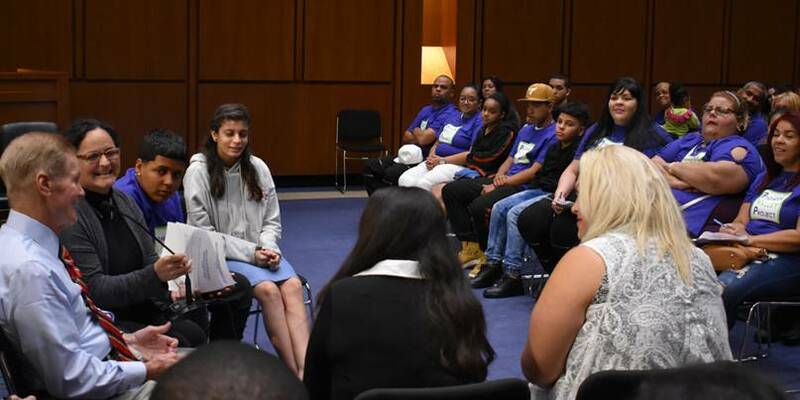 U.S. Sen. Bill Nelson (D-FL) met with a group of approximately 100 displaced Puerto Rican residents in Washington D.C. today. Governor Rick Scott today announced that Florida has donated 25 Florida Highway Patrol (FHP) vehicles to the Puerto Rico Police Department to support law enforcement needs and Hurricane Maria recovery. This announcement is part of a continued commitment from the state of Florida to assist Puerto Rico as they recover from the devastating impacts of Hurricane Maria. The vehicles had been out of circulation and were ready for surplus before they were donated. Per the state’s replacement criteria, FHP law enforcement vehicles may be taken out of circulation when they reach 80,000 miles or are eight years old. In November, 50 FHP troopers were deployed to Puerto Rico for one month to assist the Puerto Rico Police Department with security operations and traffic control needs. On September 28th, at the request of Puerto Rico Governor Ricardo Rosselló, Governor Scott traveled to San Juan, Puerto Rico to help coordinate response and recovery efforts following Hurricane Maria. On October 5th, the Governor entered into a host-state agreement with FEMA – Florida is the only state willing to enter into this type of agreement to help families displaced by Hurricane Maria. On October 11th, Governor Scott met with Chairman of the House Appropriations Committee Congressman Rodney Frelinghuysen, Chairman of the House Committee on Agriculture Congressman Mike Conaway, Chairman of the House Committee on Homeland Security Congressman Michael McCaul, and Congresswoman Jenniffer González-Colón. On October 30th, the Governor’s office sent a letter to the Office of Management and Budget. See the letter HERE. On November 3rd, Governor Scott led a delegation of Florida utility providers to Puerto Rico at the invitation of Governor Ricardo Rosselló. On November 9th, the Governor activated the State Emergency Response Team to assist families displaced by Hurricane Maria. See the Governor’s press release HERE. On November 15th, the Governor sent a letter to U.S. Senate Majority Leader Mitch McConnell and House Speaker Paul Ryan urging them to support Florida’s efforts to support those displaced from Puerto Rico by Hurricane Maria. See the Governor’s letter HERE. On December 21st, Governor Scott spoke with Congresswoman Jenniffer González-Colón regarding Puerto Rico’s recovery from Hurricane Maria. On December 22nd, Governor Scott spoke with U.S. Department of Homeland Security Secretary Kirstjen Nielsen regarding recovery efforts for Florida and Puerto Rico. On January 3rd, Governor Scott sent a letter to the United States Senate Committee on Appropriations urging the Senate to immediately pass a significant Hurricane Irma and Maria disaster relief package. See the Governor’s letter HERE. On January 11th, Governor Scott spoke with Federal Emergency Management Agency (FEMA) Administrator Brock Long regarding the FEMA Transitional Sheltering Assistance (TSA) program and the importance of continued communication between federal, state and local partners as families continue to recover from Hurricane Maria. On January 12th, Governor Scott met with Governor Ricardo Rosselló and joined him for a Puerto Rico recovery town hall meeting to discuss ongoing relief efforts. On January 24th, Governor Scott, Texas Governor Greg Abbott, California Governor Jerry Brown and Puerto Rico Governor Ricardo Rosselló issued a joint letter urging the U.S. Senate to improve and expeditiously pass supplemental disaster funding, and for Congress to send the bill to the President. See the letter HERE. On February 5th, Governor Scott visited Puerto Rico with Governor Ricardo Rosselló to assist with ongoing Hurricane Maria recovery efforts. On February 7th, Governor Scott spoke with FEMA Administrator Brock Long regarding Governor Scott’s recent trip to Puerto Rico. On February 7th, Governor Scott announced a new partnership to connect families displaced by Hurricane Maria with jobs in Florida. See the announcement HERE. On March 5th, Governor Scott traveled to Puerto Rico to meet with Congresswoman Jenniffer González-Colón and attend the Puerto Rico State of the State Address. On April 18th, Governor Scott met with Congresswoman Jenniffer González-Colón in Washington D.C. to discuss how Florida is working to help Puerto Rican evacuees in the state. On April 18th, Governor Scott also spoke with FEMA Administrator Brock Long to discuss the FEMA Transitional Sheltering Assistance (TSA) program and the importance of keeping the FEMA case managers the Governor previously requested on the ground across the state. On May 18th, Governor Scott announced that Florida Department of Education Commissioner Pam Stewart would travel to Puerto Rico on May 20th to meet with Puerto Rico Department of Education Secretary Dr. Julie Keleher and offer continued guidance and support. See the Governor’s announcement HERE. On May 31st, Governor Scott traveled to Puerto Rico at the invitation of Puerto Rico Governor Ricardo Rosselló to continue to offer guidance, advice and assistance regarding ongoing Hurricane Maria recovery efforts. During his visit, Governor Scott met with Governor Rosselló, Lieutenant Governor and Secretary of State Luis G. Rivera-Marin, and Speaker of the House Carlos Johnny Méndez. Following a recently announced $1 million investment in Florida’s workforce system to help Puerto Rican families find jobs, today, Governor Rick Scott announced a new job placement partnership between education, business and workforce development organizations. CareerSource South Florida, the Puerto Rican Chamber of Commerce of South Florida and the Ana G. Méndez University System will work together to connect families relocating from Puerto Rico with available job positions and provide needed job training. Today’s announcement took place on the South Florida campus of the Ana G. Méndez University System, which has provided scholarships for more than 50 Puerto Rican students to continue their studies in Florida. CareerSource South Florida and CareerSource Central Florida are continuing to provide employment services at Multi-Agency Resource Centers in the Orlando area and Miami International Airport to Puerto Rican families displaced by Hurricane Maria. Several local workforce development boards have held recruiting fairs and workshops to assist Floridians and others impacted by last year’s hurricanes. For additional information about employment opportunities, please visit employflorida.com, available in English and Spanish. During a Puerto Rico relief roundtable today Governor Rick Scott announced the signing of Executive Order 18-17 to extend Executive Order 17-259 for all 67 Florida counties in response to Hurricane Maria. This executive order will ensure that the state can continue to welcome families displaced by Hurricane Maria. This declaration will also allow the state to continue providing important resources and assistance needed to best accommodate the needs of families impacted by Hurricane Maria in Florida. Families displaced by Hurricane Maria are continuing to arrive in Florida and the state must do everything possible to help these families. Florida will continue to coordinate with FEMA to provide Maria survivors who have traveled to the state with important services such as housing assistance, crisis counseling and unemployment assistance. To view Executive Order 18-17, click HERE. For more information on what the State of Florida is doing to support Puerto Rico, click HERE. Governor Rick Scott and Volunteer Florida today announced that volunteers have served more than one million hours in Florida following Hurricanes Irma and Maria. To date, more than 22,500 volunteers have donated their time to assist those affected by these storms, and disaster relief organizations have documented 1,003,394 hours of volunteer service. Volunteer Florida continues to encourage Floridians who want to volunteer to find more information about their local volunteer organizations and opportunities HERE. As the state’s lead agency for volunteers and donations before, during, and after disasters, Volunteer Florida works closely with the Florida Division of Emergency Management, local and state government, the private sector, and nonprofit partners to coordinate volunteers and donations during times of need. Additionally, the Volunteer Florida Foundation administers the Florida Disaster Fund, the state’s official private fund for disaster response and recovery. The Florida Disaster Fund has raised more than $14.5 million to support those impacted by Hurricane Irma. As Congress begins work on a third disaster supplemental bill to help fund recovery efforts in areas hit hardest by Hurricanes Maria, Irma and Harvey, U.S. Sen. Bill Nelson (D-FL) today urged Senate appropriators to include in the bill additional funding to help schools impacted, both directly and indirectly, by the storms. It’s been nearly two months since Hurricane Maria devastated the island of Puerto Rico and already more than 140,000 Puerto Ricans have arrived in Florida, with tens of thousands more expected to arrive in the coming months. Among those evacuating to the mainland are thousands of children and students looking to continue their educations by enrolling in schools throughout Florida. According to local school districts, more 3,300 displaced students have already enrolled in schools throughout Orange and Osceola counties, while more than 600 students have enrolled in schools in Miami-Dade County. The sudden influx of students can place a tremendous strain on a local school district’s budget and resources. Congress is expected to take up and pass a third disaster supplemental bill before the end of the year. In addition to Nelson, the letter sent today was signed by Sens. Richard Blumenthal (D-CT), Kamala Harris (D-CA), Edward Markey (D-MA), Christopher Murphy (D-CT) and Elizabeth Warren (D-MA). Following is text of the senators’ letter, a pdf copy is available here. As Congress crafts a supplemental appropriations package to help areas affected by recent disasters, including Hurricanes Maria, Irma, and Harvey, we ask you to consider the needs of local educational agencies (LEAs), Head Start agencies and early childhood education programs, in addition to colleges and universities. As many students are forced out of their schools as a result of these disasters, it is critical to think about the areas both directly affected by the natural disasters, as well as the areas that are enrolling displaced students. Without additional resources, our public schools, and colleges and universities will not be able to create an environment where our students can learn, which is absolutely critical for students who have been forced out of their old schools. The school systems in Puerto Rico and the U.S. Virgin Islands are in a state of crisis. Many schools on the island remain closed, without electricity and water, one month after Hurricane Maria hit the island. It could be several weeks or even months before students can return to their schools. With numerous weeks and possibly months of closed doors, thousands of children are displaced and meet the federal definition of homelessness in the education subtitle of the McKinney-Vento Act. Students are further challenged by a lack of food and a safe space that they have come to rely on at school. It is vital that Congress consider these needs and provide significant funds to address the needs of students, families, and staff the areas affected by recent storms and natural disasters. Across Florida, Texas, Puerto Rico and the U.S. Virgin Islands, our schools, Head Start agencies, and other early childhood education programs, will need substantial financial assistance to restart school operations, capital funding to repair and rebuild facilities, and funding for supplemental health, including mental health services for students and staff affected by the storms. As thousands of Puerto Rico residents are being forced to leave their homes and schools, LEAs in Florida, New York, and many other states are welcoming the families and children. While some have been able to temporarily relocate to mainland campuses, most students are left with few resources and limited options. It is important that LEAs serving children from preschool through grade 12, Head Start agencies, colleges and universities have the necessary resources to provide a high-quality education for all of their students, especially evacuees who are trying to restart their education and rebuild their lives. In addition, these students may need additional language supports to learn the English language, which should be carefully considered as you put together additional aid packages. In the wake of Hurricanes Katrina and Rita, Congress acted to ensure additional resources were allocated to ensure our schools could serve and educate children, especially those displaced by the storms. We ask Congress to take a similar approach that recognizes the financial needs of our schools to support students and their families experiencing homelessness in this time of dire need. We stand ready to work with you to address the educational needs of all students affected by these devastating hurricanes. Thank you for your attention to this matter. Governor Rick Scott directed the Florida Division of Emergency Management (FDEM) to activate the State Emergency Operations Center (SEOC) to Level 2. This means the State Emergency Response Team (SERT) has activated, enhancing coordination between federal, state and local emergency management agencies. Today’s activation is in response to theFederal Emergency Management Agency (FEMA) offering Transitional Sheltering Assistance (TSA) to Puerto Rican families in Florida who were displaced by Hurricane Maria. All TSA expenses and costs will be paid for directly by FEMA with federal funding. All state emergency management costs related to sheltering for displaced Puerto Rican families in Florida are 100 percent reimbursable by FEMA due to the Florida’s federal Host State Agreement. For more information on the federal Host State Agreement between the State of Florida and FEMA, click HERE. For more information on FEMA’s Transitional Sheltering Assistance, click HERE.